Sitting here listening to the different speeches and presentations since this morning, I wonder whether I came to this conference just to be terrified. You see, the worse the situation gets at the two poles, in the Arctic and the Antarctic, the more worried we islanders get — and the more frantic we are going to get — on the islands of the globe, including the SIDS, the small island developing states, of the tropics like Seychelles. For the more your ice melts in the north and the south, and on the mountain tops and in the glaciers of the world, the more our world, in tiny Seychelles just 4 degrees south of the Equator and in the rest of the Indian Ocean and in the Pacific, the Atlantic and the Caribbean as well, the more our world goes under. But it is not just about that, as serious and as frightening it indeed is: the melting ice at the poles is not just contributing to sea level rise, it is affecting the oceans as drivers of the world’s climate as well. And don’t forget, while we may be the smallest countries in the world, many of us make up huge ocean territories. But it is also true that our own climate and weather, a world away from the polar regions, are changing because of what is happening to the oceans. Let me give you an example from my own country Seychelles, where incidentally we are blowing up the granite of our mountains to get rocks to protect and save our beaches so bad is the coastal erosion. In Seychelles we have two seasons, the rainy season from October to May and a dry season from June to October. You know the dry season is turning into a serious drought when the authorities announce two things. The first is that water restrictions are being introduced, meaning that piped water supplies to the population from our dams and reservoirs will be cut to a few hours a day. The second is that a ban on lighting fires is being imposed. This makes it illegal to even light a fire to burn dry leaves in your garden for example, for fear that it gets out of control and spreads to our beloved forests — Seychelles is one of the most forested countries in the world — at a time when there is a shortage of water to fight brush and forest fires. These restrictions on water supplies and on lighting fires have traditionally been announced around July or so as the dry season traditionally sets in. This year ladies and gentlemen, the water restrictions were announced in February, that is five, yes five months ahead of time and despite Seychelles having spent millions these past years on measures, including expensive desalination plants, to try and cope with the failing rains! And the ban on lighting fires followed towards the end of March, four months earlier than usual. So I say to the peoples of the Arctic: to the Inuit of Canada, Alaska and Greenland, to the Sami of Sweden, Norway, Finland and Russia and all the other indigenous peoples of the polar North, we the islanders of the tropics feel your pain…we share your fears! Our regions are among the most sensitive barometers of global environmental change. Societies and livelihoods in both the Arctic and the SIDS are especially vulnerable to climate change because of our close ties to land and sea environments. When your world changes for the worse around you…so does ours on the beaches of Seychelles and on the flat coral atolls of Maldives in the Indian Ocean, on the beaches and atolls of Tuvalu and Kiribati in the Pacific, on the drying slopes of Cape Verde in the Atlantic, and on the low islands of the Bahamas and Bermuda in the Caribbean. Although our natural and human environments differ markedly, what is happening at the poles is damaging the ecology, economies and the social and cultural fabric of all our regions posing serious challenges for their sustainable development. Indian Ocean, the Pacific, the Atlantic and the Caribbean. In fact, Many Strong Voices — and my, aren’t our voices getting stronger the more we are faced with relocation, displacement, destruction or disappearance — Many Strong voices was launched in this very conference centre at the climate change negotiations in Montreal in December 2005. Global linkages indeed: if I, a Seychellois islander of the Indian Ocean, feel it important to be with you here to add my few remarks on the global linkages of what climate change is doing to the North and South poles — I could have easily been a Pacific, Atlantic or Caribbean islander — it means these linkages stretch to EVERY corner of the planet. And when these linkages affect me in the Indian Ocean, it means that when you mess up the lives of the peoples of the Arctic and the natural world of the polar regions, you mess up MY life and the lives of every other human being, and the biodiversity of every continent, on Earth. So when those most responsible for the pollution and stewardship of the polar regions drag your feet about doing something, or REFUSE to do what is necessary, to save or at least mitigate the harm being done to the Arctic and the Antarctic, you deserve, and will be richly delivered, the condemnation of all the people’s of the Earth…for you harm us all. 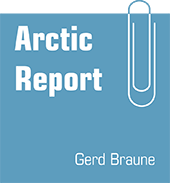 Would be good to post „arctic-report“ in facebook. I’ve posted your URL and the last articles from „Polar Year 2012 Conference“ on my profile. so my friends can find your very interesting and alarming reports. A very good speech, indeed, but I am not surprised. M. Jumeaux usually speaks in a very direct way. He speaks like he thinks, with simplicity. Since I agree 100% his views, I have translated partly the speech that is published now on the Indian Ocean Commission web site dedicated to climate change i.e. Acclimate.